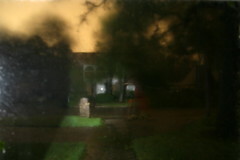 Hurricane Ike hit Houston this last Friday night. And he was deadly. And very damaging to say the least. First and foremost my thoughts and prayers are with those in Galveston and south of the city who lost the most. The city has a week long 9:00 PM curfew so we are working short days, 9:30 to maybe 4:30 to allow time to get home without most traffic lights. We are talking a lot. Hotels are full of evacuees and downtown is closed and in bad shape. The Chase tower in particular was transformed into broken glass on the streets. If you want to help, this one client reached out to us to help spread the word. challenging. People experience grief, but learn to cope and move on. There are so many blog posts and photos that should have been taken.